Are you old enough to remember what it was like growing up in the 70, 80s or even the early 1990s? If so, you’ll agree that life was pretty different right? If not then, let me explain. Life was very simple. There was no such thing as mobile phones, or personal computers, or smart devices. We didn’t have email, or social media, and - as old photographs we’ve rummaged through clearly prove – we had very little fashion sense either. Even food was different. Huh? Don’t get us wrong, we still ate plenty but by and large eating was functional. The Michelin man (remember him?) was talked about, Michelin stars were not. You see the fact is that not only was there very little choice when it comes to consumer goods, money was also a lot scarcer than it is today: we were a much poorer country, people didn’t have credit cards (imagine?! ), and because families still very much believed in living within their means they ate three square meals a day, all sat around the table together in perfect harmony, with no devices to turn to for distraction. Breakfast in the olden days! Given all of the above, it’s hardly surprising that the humble bowl of porridge was a pretty plain and almost universally un-appetising experience: no frills, no fancy toppings, and no fuss. Just porridge oats boiled on the cooker with nothing added but water and maybe a dash of salt: healthy, filling, and functional. But that was the ethos and the culture of the day; sugary cereals, as we know them today, simply didn’t exist and breakfast was still very much regarded as a meal whose function was purely to ‘set you up for the day’. While porridge (as in the actual oat product itself) is pretty much the same now as it has been for centuries, nothing added or taken away; what is very different is the way in which it’s now perceived: where once the morning porridge experience was a rather depressing and indeed functional one, now it’s anything but! Whereas now we choose to enjoy a lovely hot bowl of porridge on a cold winter’s morning, right up until around 10 years ago it was something that we endured. In other words, we ate it because as kids growing up it was what we were given in the morning, and told to ‘eat up, it’s good for you’! Just think about the breakfast aisle of your local supermarket: where once you’d have struggled to spot porridge oats amongst the rest of the more ‘bling’ cereals, now you’ll see an entire section devoted to porridge oats. Furthermore, it’s no longer the one-size-fits-all product it used to be; now you’ll find it in small packet sizes, big packet sizes, single portion porridge servings, microwaveable single-serve porridge sachets, multi-flavour porridge oats sachets, on-the-go pots, ready-to-eat oat cereals…..
Yep, it’s pretty evident alright that porridge is no longer just ‘plain old oats in a pack’. Now it’s an entire product line that offers so many options you’ll need 10 minutes to choose the right one for you! Thank fully the days of porridge being a purely functional foodstuff, one that wasn’t ever designed to be enjoyed, are long gone. Hallelujah. Now it’s a breakfast that kids and adults love, partly because as a much more sophisticated society we’ve finally discovered that it’s not hard to make porridge taste delicious! 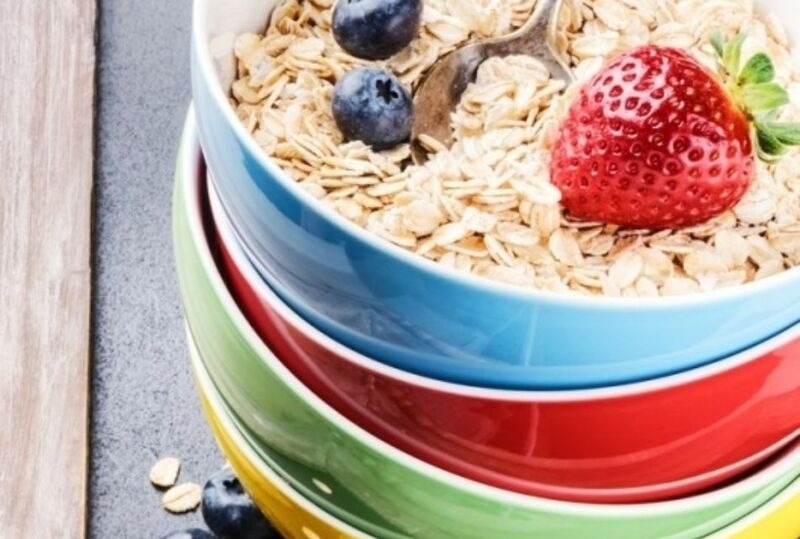 Today’s perception of porridge oats as a truly delicious and versatile breakfast option is evident from the many colourful and experimental toppings being posted and shared. No two bowls of porridge need ever be the same: add seeds or fruit, yoghurt or cream, chocolate or whiskey, honey or maple syrup. In fact, add whatever you choose because at the end of the day, what makes your porridge so delicious is the fact that you decide exactly how to make it uniquely yours!